Home Applications Everyone goes to watch movies with Movies Now! Everyone goes to watch movies with Movies Now! Are you the one who tends to fallow the chain of movies shown in the cinema or just like to attend it with your friends somehow in the evening? Then you should definitely fill up your iphone app collection with one more, called Movies Now! Now you will always be aware which movie is available in your vicinity and when to go and watch it. Moreover you will be able to buy tickets within the app but only if you are in USA or Canada. Besides you will be pleasantly surprised with the beautiful interface and great user experience. 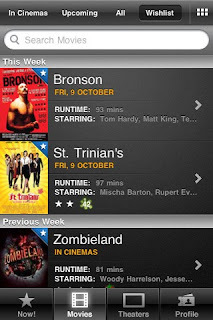 The app has a great variety of features to keep you always up to date what's going on in the world of movies, even see top 10 US Weekend Box Office and Read synopses, cast list, run times & watch trailers. With just a single touch of button you will have the whole lists of movies being playing around. With built-in google maps you will be able to find quickly cinemas in your location and add them to a favorites list for faster access. This is not yet the full list of abilities within this app.If you want to know more about Movies Now! you can download it for free right here!! !